The mega boom in app culture which has accompanied the proliferation of smartphones has been extremely productive. Consumers today have more choices in Android apps than ever before. There exists an app for virtually every problem out there. Also there has been a lack of apps which address issues related to Finance. Case in point, there aren’t too many apps which can help business people. Until now, even the ones that are available aren’t too beneficial. 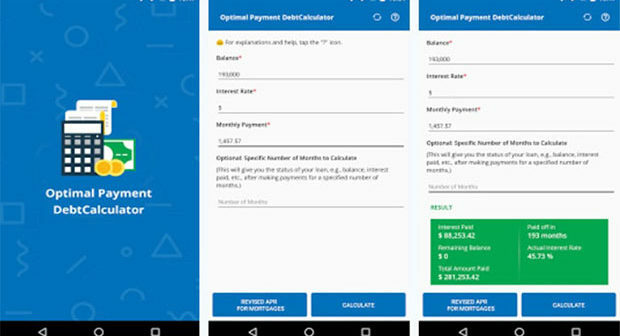 Optimal Payment Debt Calculator Android developed by Elias Lorette app changes all of that. It is often said that loans are actually set up to maximize the amount of interest paid, Optimal Payment Debt Calculator is wholly meant for those of people who have car loan, credit card debt, a student loan, or a house mortgage debt to pay off, and who like to minimize the amount of interest they have to pay. The important purpose of the calculator is to determine which several payment amounts would permit you to reduce your interest charges as much as possible by changing the amount of the monthly payment or adding payments to the principal. With other vital aspects the lender presented calculation permits you to view how long it would take you to repay the debt; how much interest you would pay, and the percentage rate of interest you would actually pay on the debt. By primarily using this familiar app the users could adjust their monthly payment to achieve an optimal result. In situations, if users like to pay no more than $300 dollars interest on a 6000 dollar loan (5%), they could plug in the figures and calculate the amount you require to pay every month, until you reach a 5% result. It is conveyed that $457 for 14 months, given a loan rate of 8%. The users could also put in several payment amounts, until they find a payment that yields an interest rate which seems reasonable to you. Users with this app could actually view how much money that can be saved if you pay down the balance immediately with. In precise terms, you would get a 72% return on your $3000. With usage of this debt calculator, the users could primarily determine that if they double the payment you are making, and direct that ½ of the payment goes directly to the principal, that users could save thousands of dollars, substantially lowering your actual interest rate. In an already sparsely populated Android apps segment, Optimal Payment Debt Calculator Android stands out as a clear winner. The app performs all functions a user could want from. The app is fully fledged and accomplishes much more than just simply finance app. The best part of the app is that it’s astounding and performing better given the quality of the app. According to experts most of the users could see lot of methods, strategies, and Android apps that could be used to track your debts. Even more this app would provide you a better starting point, so users could begin their journey in prosperous manner.